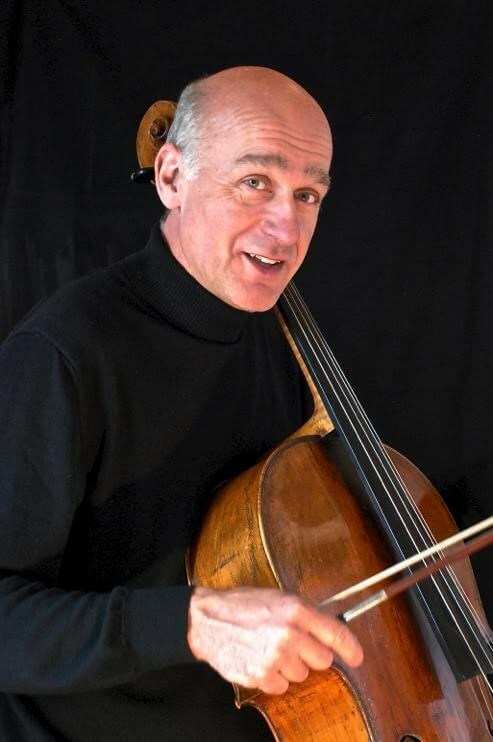 Luc Tooten was for more than fifteen years the first cello soloist of the Brussels Philharmonic. He studied at the Brussels Royal Conservatory with Carlo Schmitz and completed his education with Edmond Baeyens and Reine Flachot . He also attended the masterclasses of Gerhard Hamann, Anner Bijlsma and Mstislav Rostropovitch.After winning several international prizes, he made his debut as a soloist performing the Saint Saëns Cello Concerto with the Belgian Radio Symphony Orchestra. His performance of the Korngold Cello Concerto was broadcast by the VRT, the Flemish Television. His recording of the symphonic poem “Naar Hoger Licht “, a composition for cello-solo and orchestra by Lodewijk De Vocht, received a Choc award from the music periodical Monde de la Musique. In 2015 he was invited in Saint Petersburg to make a CD recording of the Triple Concerto of Beethoven with the St.-Petersburg State Symphony Orchestra. He performed as a soloist under the direction of conductors such as Andrej Borejko, Jan Latham-Koenig, Yoël Levy, Walter Proost, Alexander Rahbari and Tan Dun. At Tan Dun’s request, he played the Belgian premiere of the cello concerti Crouching Tiger and The Map. As a chamber musician he has performed in Europe, Israel, Canada, China, Mexico and the USA. Luc is a frequent guest at festivals where he performs with well-known musicians such as Martha Argerich, Boris Berezovsky, Ivry Gitlis, Jean-Bernard Pommier, Eliane Rodrigues, Paulina Leschenko, Michel Letiec, Frank Braley, Itamar Golan, Michael Guttman and Vadim Repin, ./.. He made many recordings for Pavane Records Belgium, such as Franz Liszt and Lalo’s complete works for cello and piano, and also the sonatas by Frédéric Chopin, Claude Debussy, Camille Saint-Saëns and Franz Schubert. Together with Trio Portici (Damien Pardoen, violin and Stéphane De May, piano) he recorded chamber music by Felix Mendelssohn-Bartholdy, Frédéric Chopin, Claude Debussy, Sergey Rachmaninov, George Onslow, Robert Schumann, César Franck and Franz Schubert. Kalidisc released also a CD with previously unpublished works by tango composers like José Bragato and Ástor Piazzolla. Luc Tooten a été pendant plusieurs années premier violoncelle solo de l’orchestre Brussels Philharmonic sous la baguette de Alexander Rahbari, Frank Shipway, Yoel Levy et Michel Tabachnic. Diplômé du Conservatoire Royal de Bruxelles , dans la classe de Carlo Schmitz, il a suivi les cours de Edmond Baeyens et Reine Flachot. Il s’est perfectionné auprès de Gerhard Hamann, Anner Bijlsma et Mstislav Rostropovitch. Il a fait ses débuts comme soliste dans le concerto pour violoncelle de Camille Saint Saëns avec l’Orchestre Symphonique de la Radio Belge. Il a joué la première belge du concerto pour violoncelle et orchestre de Korngold, concert qui fut enregistré par la Télévision Flamande VRT. Son enregistrement du Poème Symphonique “Naar Hoger Licht” pour violoncelle et orchestre de L. de Vocht a reçu un “Choc” du monde de la musique. En 2015 il a été invité à St Petersbourg pour enregistrer avec Chingiz Osmanov, Eliane Rodrigues et l’Orchestre Symphonique d’Etat de St Petersbourg” le Triple concerto de Beethoven, qui est paru sous le label Stylin’Art. Il s’est produit en tant que soliste sous la direction de chefs éminents tels que Yoel Levy, Alexandre Rahbari, Michel Tabachnic, Jan Lathem-Koenig, Walter Proost, Hervé Niquet, Andrey Boreyko et Tan Dun. A la demande de ce dernier il a joué la première en Belgique de ses concertos “Crouching Tiger” et ” The Map”. Ses nombreux concerts de musique de chambre l’ont mené dans toute l’Europe, ainsi qu’au Canada, en Chine, en Israël, au Mexique et aux Etats-Unis. Invité à des Festivals prestigieux comme celui de Pietrassanta , il collabore régulièrement avec Martha Argerich, Boris Berezovsky, Ivry Gitlis, Jean-Bernard Pommier, Eliane Rodrigues, Michel Letiec, Polina Leschenko, Itamar Golan, Frank Braley, Michael Guttman et Vadim Repin. Il a reçu les éloges de la presse musicale pour ses enregistrements de musique de chambre. Chez Pavane Belgium sont parues l’intégrale des sonates de Saint-Saëns, les œuvres pour violoncelle de Liszt , les sonates de Chopin, de Debussy et l’Arpeggione de Schubert. Avec le Trio Portici (Damien Pardoen violon et Stéphane De May, paino) il a enregistré des trios de Mendelssohn, de César Franck, de Chopin, de Debussy, de Schubert, de Rachmaninov, de Onslow, de Schumann et sous le label « Kalidisc » un recueil original d’oeuvres des compositeurs Argentins Piazzolla et Bragato. Luc Tooten was gedurende jaren eerste solocellist van het Brussels Philharmonic. Hij studeerde aan het Conservatorium van Brussel bij Carlo Schmitz en vervolmaakte zich bij Edmond Baeyens en Reine Flachot. Hij volgde meestercursussen bij Gerard Hamann, Anner Bijlsma en Mistislav Rostropovitch. Hij was laureaat van verschillende nationale en internationale prijzen en maakte zijn debuut met het celloconcerto van Camille Saint Saëns samen met het BRTN Filharmonisch Orkest. Zijn uitvoering van het celloconcerto van Korngold werd een televisiepremière voor de VRT. De cd-opname van het symfonische gedicht voor cello en orkest “Naar Hoger Licht” van L. De Vocht, samen met het Vlaams Radio Orkest werd door het muziektijdschrift “Monde de la Musique” bekroond met een “Choc”. In 2015 werd hij uitgenodigd in Sint-Petersburg om samen met Chingiz Osmanov, Eliane Rodrigues en het St.-Petersburg State Symphony Orchestra onder leiding van Walter Proost het Tripelconcerto van Beethoven op te nemen. Hij trad als solist op in binnen- en buitenland onder de leiding van vermaarde dirigenten als Yoel Levy, Alexander Rahbari, Michel Tabachnic, Walter Proost, Jan Latham-Koenig, André Borejko, Tan Dun. Op verzoek van laatstgenoemde verzorgde hij de Belgische creatie van de celloconcerti “Crouching Tiger” en “The Map”. Hij concerteerde in kamermuziekverband in Europa, Israël, Canada, China, Mexico, en de USA. Jaarlijks wordt hij uitgenodigd op grote festivals waar hij musiceert met grote namen als Martha Argerich, Boris Berezovsky, Ivry Gitlis, Jean-Bernard Pommier, Eliane Rodrigues, Paulina Leschenko, Michel Letiec, Frank Braley, Itamar Golan, Michael Guttman en Vadim Repin. De cd-opnames van Luc Tooten, waaronder de cellosonates van Saint Saëns, het cello-oeuvre van Liszt, de cellosonates van Chopin, Onslow en Debussy en de “Arpeggione sonate” van Schubert werden uitgegeven door het Belgische label “Pavane”. Samen met het Trio Portici (Damien Pardoen, viool en Stéphane De May, piano) nam hij kamermuziek op van Mendelssohn, Franck, Onslow, Chopin, Debussy, Schumann, Schubert, Rachmaninov. Bij het label “Kalidisc” bracht hij onuitgegeven werk uit van tangocomponisten als Bragato en Piazzolla.